The unidentified duck in the photograph below takes off. Upon a clue from Bill Lattrell who loves wild places (see his Wild Ramblings blog), the duck may be a Redhead (Aythya americana). Field marks from Peterson’s include the male that is gray with a black chest and round red-brown head; the bill blue with black tip. Both sexes have gray wing-stripes. 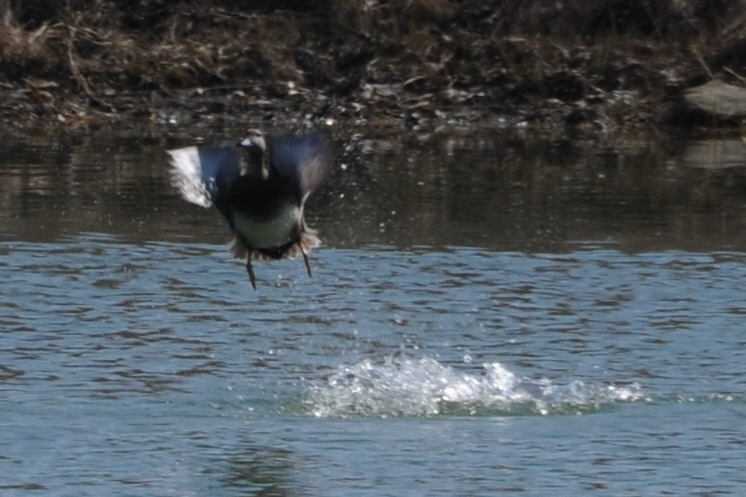 I have one additional photograph of the duck as it took off from the pond. Tentatively a Redhead duck in takeoff from pond (February 2011). The other aspect that may be a factor in identifying the duck as Redhead is that they patter along the surface while getting underway. From the photograph above, you can see the traces of a patter? It all happened so fast when the duck took flight that I could only snap two pictures. (There is a camera feature to take rapid sequential shots that I should turned on.) The other photograph is in a previous post yesterday. It is the same duck. In any case, if any of you have an opinion about the duck above, please comment or write me at matthewsranch@msn.com. Duck feedback anyone?